Luci and her husband Joaquin own a small Mexican grocery store where we often go to buy tortillas, masa harina, avocados, dried chiles, limes, and other ingredients for Mexican dishes. One of the first times I was in their store, I spotted several bins of unfamiliar varieties of dried beans. As I was pondering my choices, Joaquin disappeared into the back room and came back with a small bowl of freshly cooked beans. “Here,” he said, offering me the bowl. “My wife just cooked these, and you can see what they taste like. She puts a dried chile in the pot while they cook to make them taste really good. She is a very good cook.” He was right, and I bought a bag of those beans. Some time later, Drew discovered that Luci makes delicious tamales on special order. A customer had failed to pick up his order, so Joaquin asked Drew if he would like to take them. Of course he did, and soon a bag of tamales was put aside in the freezer for us whenever Luci had extra. Even better, Luci agreed to come to our house and show me how to make this wonderful celebration food. Tamales are perfect special occasion, or fiesta food because they are richly delicious and fun to make. 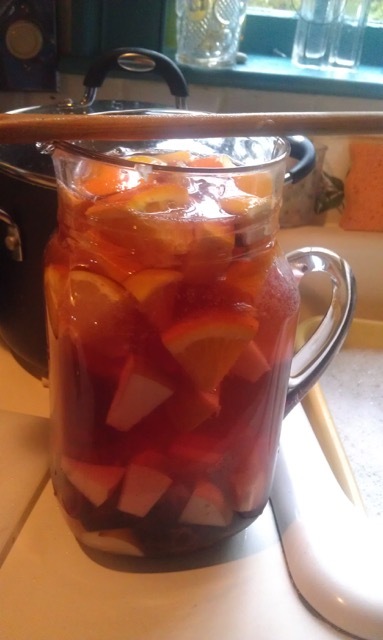 The preparation is somewhat lengthy and best accomplished with several helping hands and a pitcher of Sangria. The tamales need to steam for 1 1/2 hours, so you may as well make a lot and get some help making and eating them. Have a tamales party! That’s what I did. I invited friends to help cook and eat, Suzy made Sangria, and Luci arrived with her son Bryon to help translate for us. 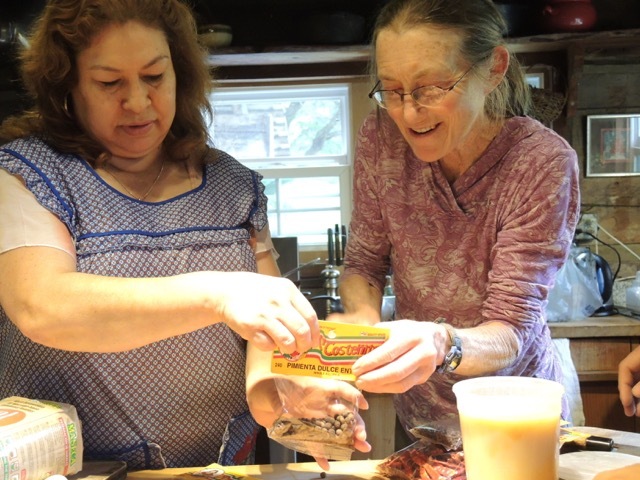 They brought ingredients for three different kinds of tamales and two different salsas, and soon we had pots boiling, spices toasting, masa mixing, and cornhusks soaking. A feast was on its way. When Luci first came to the United States 20 years ago, she couldn’t find cornhusks for sale so she used aluminum foil to wrap her tamales. But dried cornhusks are commonly available now, and they make an exceptionally pleasing and aromatic wrapper. Four oz. dried cornhusks will wrap 16 tamales. Rinse the dried cornhusks off in the sink. Place them in a large bowl and cover with hot water. Weigh them down with a plate and allow to soak for at least an hour. If fresh masa is available, use it. Otherwise, use coarse-ground dehydrated masa harina labeled for making tamales, rather than fine-ground masa used for tortillas. Two cups dried masa will make 16 to 20 tamales. Luci grew up making tamales in her home state of Hidalgo, Mexico. She doesn’t measure. She just pours out a small mountain of masa, covers the peak with salt, works in a few handfuls of soft lard, and adds water from the tap until the consistency feels right. The batter should be soft and spreadable, but not runny. Luci mixes her batter entirely with her hands. She starts with the masa and salt, and then works in room-temperature lard, adding warm water in stages until the dough is like soft cookie dough. Using broth in place of water makes a more flavorful batter. Put the pork in a saucepan with the water and salt. Bring to a boil, reduce the heat and partially cover; simmer over medium-low heat for about one hour, or until the meat is fall-apart tender. Drain (reserve the liquid for making masa or other use). Shred the pork, using fingers or 2 forks. Toast allspice berries, cloves, and black peppercorns on an iron skillet over medium heat until fragrant, 1 to 2 minutes. Shake the pan to prevent burning. Transfer to a small bowl. Seed and stem guajillo chiles and chiles de arbol. Rinse the chiles, then put them in a saucepan with 1 1/2 cups water. Bring to a boil, reduce the heat, and simmer until soft—about 1/2 hour. Put the softened chiles, cooking water, toasted spices, cumin, garlic, and salt in a blender. Puree until very smooth. Season with salt to taste. Any kind of cooked, coarsely shredded chicken can be used for the filling. I used the meat from a pot-roasted bird cooked in our wood-fired outdoor oven. Cooking the meat slowly results in a succulent texture perfect for tacos, enchiladas and tamales. Bring 8 cups water to a boil in a large stockpot. Add a thickly sliced white onion, 2 peeled and sliced garlic cloves, a chopped carrot, and 1 tsp salt. Simmer 15 to 20 minutes. Add 2 chicken legs and 2 thighs, simmer a couple of minutes, and skim any foam off the broth. 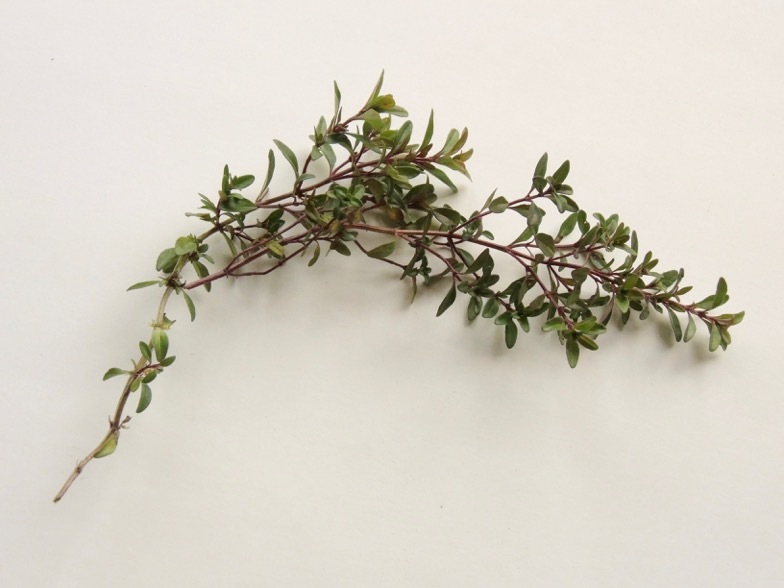 Add 2 bay leaves, 2 sprigs thyme, and a sprig of marjoram. Partially cover and cook over medium heat for 10 minutes. Add 2 breast halves and skim again, Partially cover and simmer 13 minutes. Remove the pot from the heat and allow the chicken to cool in the broth for a few minutes. Remove the chicken pieces from the broth and set aside to cool. Strain the broth and reserve for making masa or other uses. Remove the skin and pull the meat from the bones in coarse shreds. Discard skin and bones. I am always amazed at how fresh and delicious this simple sauce is. Easy to make, too! Remove the outer husks and rinse the tomatillos off in water. Stem and seed (optional) the chiles. Put the tomatillos and chiles in a pot with about 1 1/2 cups water and 1/2 tsp salt. Bring to a boil. Cook at a brisk simmer 5 to10 minutes, until softened. Add the garlic clove and simmer one or two minutes more. Take off the heat and cool slightly before transferring the mixture, including liquid, to a blender. Add roughly chopped cilantro and ground cumin; blend to make a smooth puree. Season with salt to taste. 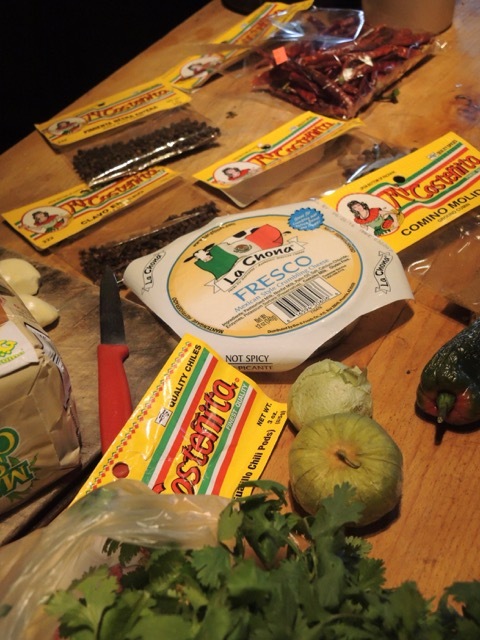 Queso Fresco is an un-aged Mexican cheese that is mild in flavor and crumbles easily—sort of like a non-salty feta or a lightly salted farmer’s cheese. Combined with some sautéed vegetables, it makes a tasty vegetarian filling. Prepare the vegetables: Cut the tomatoes lengthwise into 1/4-inch thick slices. Seed and thinly slice the chiles lengthwise. Cut the onion lengthwise into thin slivers. Warm the oil in a small skillet over medium low heat. Add the onion and chiles and season with salt; sauté 5 to 6 minutes, until softened. Add the tomato slices and cook a few more minutes. Here is where a lot of hands really help, and the party begins. You need a space to set out all the ingredients—platters of shredded meat or chicken or fish, bowls of sauces, crumbled cheese, and the sautéed or grilled vegetables. Here is how to assemble a tamale: Choose the widest, nicest cornhusks for wrappers. Start by laying out a husk on the work surface and dry it lightly with a clean dishtowel. Spread a scant 1/4-cup of the masa dough into a roughly 4-inch square across the widest end of the husk. If the husk isn’t wide enough, you can add another piece of husk to extend it. Leave a 3/4-inch border along the bottom and side edges and at least 1 1/2 inches of the pointed end of the husk. Place a few strips of chicken or meat down the center of the masa and cover it with a Tbs. or so of the sauce. If using the cheese filling, place a little of the tomato-chile mixture down the middle and sprinkle on some crumbled cheese. Folding: Fold each long side of the husk around the filling, enclosing it like an envelope. Fold the pointed end up to close the bottom. 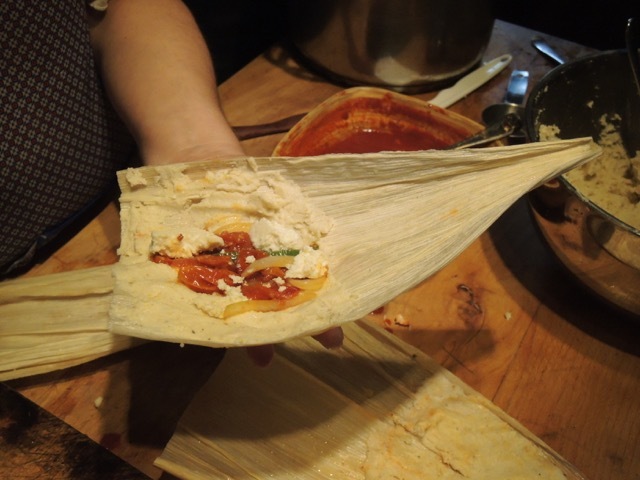 The package can be secured by tying a narrow strip of husk around the tamal and folded flap. The wrapped tamales are cooked in a steamer. Fill the bottom of the steamer with 1 to 2 inches of water and bring it to a boil. Line the steamer insert with some extra strips of cornhusk and fill it with tamales, folded side down, in an upright position. 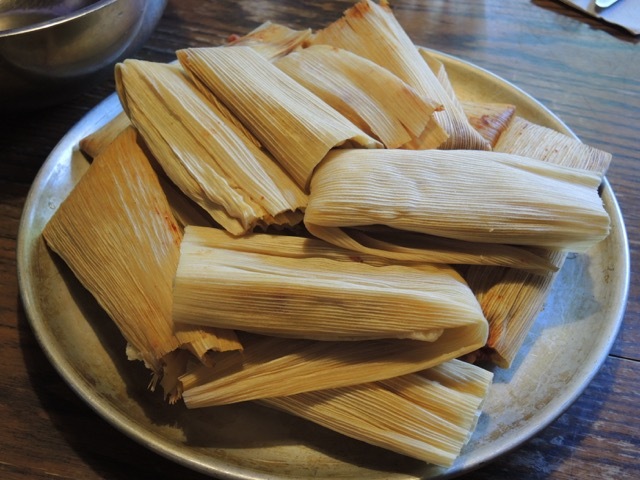 If you don’t have enough tamales to fill the steamer, use extra cornhusks or crumpled foil to fill the space so that the tamales remain upright. Put the tamales into the steamer, cover the pot, and steam the tamales over medium heat for 1 1/4 to 1 1/2 hours. The husk will peel away from the masa easily when the tamales are done. Turn off the heat and let the tamales sit a few minutes before setting them out on a platter to be devoured. Serve with additional salsa, chopped cilantro, and lime wedges, if you wish. Other wonderful tamale fillings: Strips of roasted poblano or other peppers, grilled or sautéed mushrooms, black beans and crumbled cheese, sautéed spinach or chard…just about any shredded cooked meat or cooked vegetables mixed with a little salsa or sauce. Spring Solstice–time to say good-bye to winter and welcome to spring! It’s the time of the “hungry gap” when the supply of last year’s harvest is running low, and this year’s newly planted seeds are just poking through the soil. We’re down to a few carrots and leeks, an odd beet or two, a winter squash, some potatoes, a green cabbage, and one lonely Napa cabbage. 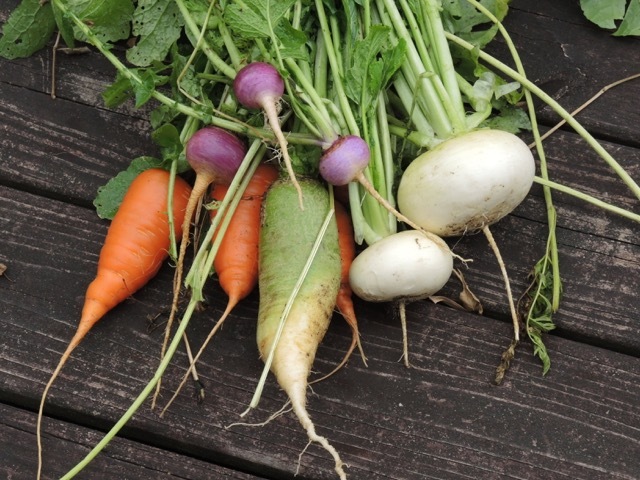 These stalwart vegetables amaze me in their ability to come through the winter underground, in the root cellar, or in a refrigerator bin and still cheerfully offer themselves for our sustenance. Wendy’s reverence for cabbage lasted through that winter and spring until the last cabbage was harvested in May. At that point, one of the Tassajara monks suggested holding a ceremony to honor the cabbage. While the gathering practitioners chanted and bowed “the last Chinese cabbage reclined ceremoniously on its right side, its green wrapper leaves tucked demurely beneath its ample carcass…expelling a world weary sigh.” It was a fitting farewell. My first winter garden in North Carolina was also planted with indecipherable seed packages from Japan (a gift from a traveling friend) that filled the garden beds with all manner of heading and non-heading members of the brassica family. The plants turned out to be extremely cold hearty, thriving under row covers and low, plastic-covered tunnels all winter long. Cabbages and chicories have been the backbone of my fall and winter garden ever since. Now, I want to honor my last cabbages not with chanting and incense but with some delicious recipes to show how much I love them. I will shower them with praise and handfuls of the first greens of spring—chives, ramps, watercress, and sorrel. 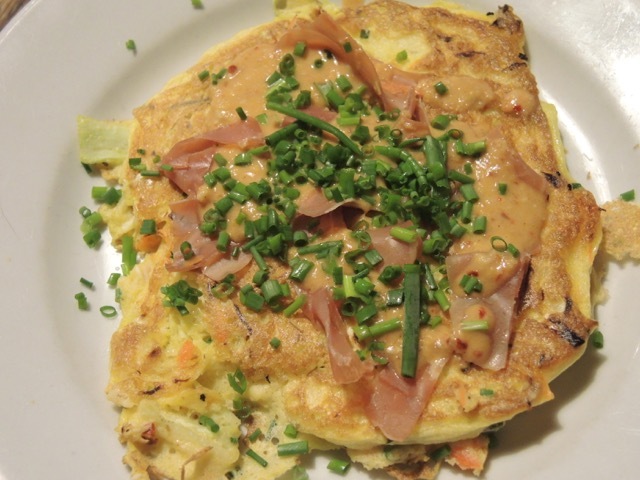 Okonomi-yaki are savory Japanese pancakes made with vegetables and other choice ingredients incorporated into the batter. The name translates as “as-you-like-it”, so that is where the choice comes in. 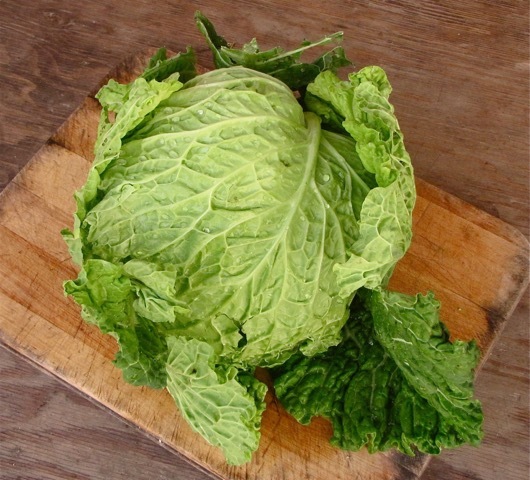 My first choice for the main ingredient is green cabbage, which is also most common in Japan. There, special pancake restaurants bring the batter and an assortment of fillings including bacon, shrimp, squid, and kimchi, as well as shredded vegetables to your table and allow you to cook your own pancake “as you like it” on a hot griddle. Our friend Minoru made okonomi-yaki for us on a visit to his home in Japan. We sat on the floor around the dining table, and he cooked the pancakes on a large electric frying pan in the middle of the table. The pancakes were filled with green cabbage, green onions, and carrot, and topped with thick slices of pork belly. Minoru shared his secret for making the most airy, delicious pancakes—he separates the eggs and beats the egg whites to frothy peaks before folding them into the batter. Ingredients for roughly 6 large pancakes: 3/4 cup all-purpose flour, 3/4 cup water, 1/4 tsp salt, 4 large eggs (separated) Note: I usually substitute 1 1/3 cups sourdough starter for the flour and water—works great! Bacon, proscuitto, ham, shrimp, etc. are optional additions. In a large mixing bowl, whisk together the flour, water, salt, and egg yolks to make a thin batter. In a separate bowl, whisk the egg whites to standing peaks—they should be stiff but still shiny and moist-looking. Heat a large griddle or frying pan over medium-high heat (electric griddle is heated to 400 degrees). Stir the shredded vegetables and herbs into the batter and mix well. Gently fold the beaten egg whites into the batter. When the pan is hot, brush lightly with oil and ladle one or more pancakes onto the surface. Place a slice of bacon on top of each pancake, if using. After about 3 minutes, flip the pancake. Cook 4 to 5 minutes, then flip again until the bacon and pancakes are cooked. Japanese like to eat their okonomi-yaki with mayonnaise and soy sauce. I think they are great with turmeric pesto, and Drew likes them with peanut sauce. Other delicious toppings include bonito flakes (or try hot-smoked salmon), pickled ginger, and chopped fresh herbs. Use a blender to puree all the ingredients. Very simple—a crunchy, flavorful addition to an okonomi-yaki meal. Add the finely sliced scallions or chives, lemon juice and zest, chile, and chopped watercress. Toss to combine. 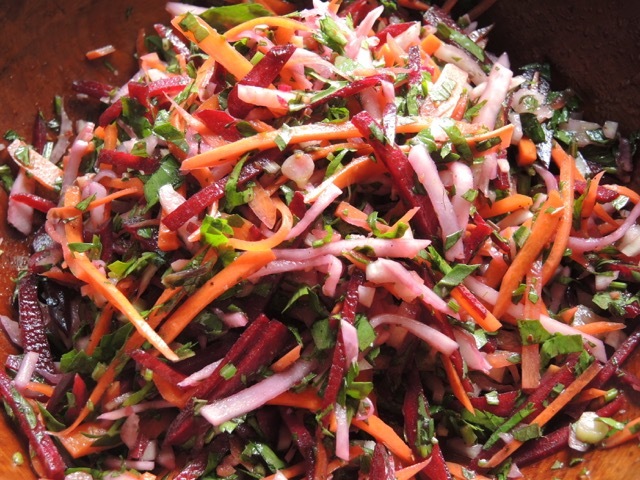 My sister Ellen makes this salad with daikon and carrot. I made it in honor of the last over-wintered carrots and napa cabbage, with the first garlic chives, arugula, and mint leaves. Toss the finely sliced cabbage, carrots, scallions, and mint in a large bowl with 1/2 tsp salt.Set aside while you make the dressing. Using a mortar and pestle, mash the garlic and a pinch of salt to a paste. Whisk in the lime juice, sugar and chile. Add the rice vinegar, soy sauce, and sesame oil. Whisk to combine. Adjust the seasoning and toss with the cabbage. Sprinkle with toasted sesame seeds before serving. I didn’t travel to the land of kimchi, but I have been exploring the world of microbes…specifically, the microbial world that thrives in a fermenting crock of kimchi. I got interested in learning more about making kimchi after reading Michael Pollan’s book, Cooked. In the book, he devotes a section entitled “Earth” to fermented foods. He traveled among the “fermentos”— explorers in the world of culinary microbes–to learn more about the benefits of fermentation. This led him to Sandor Katz, who has written two books about fermented foods, Wild Fermentation and The Art of Fermentation. Katz writes that fermentation is an “everyday miracle, performed by microscopic bacteria and fungi—the “ubiquitous agents of transformation.” I discovered that the symbiotic relationship that microbes have with the human body is just as crucial and exciting as the relationship they have with plants and garden soil. Beneficial bacteria exist symbiotically in our digestive systems, where they break down foods into nutrients our bodies can absorb and help our immune systems function. Live, unpasteurized, fermented foods are the mode of delivery. Wow! Kimchi is compost for our guts. Katz also explains that some cultures of microorganism are responsible for extraordinary culinary transformation. “Tiny beings, invisible to us, bring us compelling and varied flavors. Fermentation gives us many of our most basic staples, such as bread and cheese, and our most pleasurable treats, including chocolate, coffee, wine, and beer.” And kimchi! I wasn’t always enamored of kimchi. Two things helped me become a born-again kimchi lover. One was the realization the kimchi is basically Korean salsa. To paraphrase John Willoughby, I had achieved the zen of kimchi and was at one with the little dishes of intense flavor. The second life-changing event was the arrival of a jar of kimchi made by Hannah Chung, owner of Simply Seoul Kitchen. She is known as the Atlanta Kimchi Queen. Friends Jim and Margaret handed me the jar and warned that it should only be opened while holding it over the sink. I followed their advice, and the kimchi erupted out of the jar with an explosion of chiles and garlic. That is live culture! I wanted to make kimchi that good. So, what’s the difference between kimchi and sauerkraut? They are both made in low oxygen conditions by lactobacillus bacteria, which convert the sugars in cabbage or other vegetables to lactic acid. The fermentation helps preserve the vegetables and gives the finished product its tangy flavor. Sauerkraut is usually made with green cabbage, while kimchi is most commonly made with napa cabbage. Kimchi can include a variety of other vegetables or be made without cabbage at all, but is usually enhanced by modest-to-generous amounts of garlic, ginger, scallions, and hot red chiles. So…how to become one with kimchi? I looked around and found a wide variety of recipes with a confusing variation in ingredients. Some include apple or pear, anchovies and squid, fish sauce and shrimp, Korean chile flakes or “any form of hot pepper you like”, little ginger and garlic, lots of ginger and garlic, rice flour or cooked rice… Sandor Katz simply advises to “experiment with quantities and don’t worry too much about them.” But, I was a little worried about exploding jars or worse. With Holly’s enthusiastic guidance and a promising list of ingredients, I was ready to turn my bountiful harvest of Napa cabbages into kimchi. I followed directions for “quick kimchi,”which ferments faster and is ready to eat sooner than traditional kimchi made with whole cabbage leaves. I started with Napa cabbage, but then went on to “kimchi” almost every other vegetable in sight. Cut the cabbage into quarters lengthwise. Trim away any tough stem or core. Cut each quarter into about 5 pieces. The leafy part should be larger than the white stem sections. Wash the leaves well and drain in a colander. Transfer to a large bowl. Make a brine with the salt and water, stirring until the salt dissolves. Pour the brine over the cabbage and weight with a plate to keep the leaves submerged. Let the cabbage soak in the brine 1 to 2 hours. (Holly says one, Hannah says two)Turn the leaves so that the top goes to the bottom . Let it sit another 1 to 2 hours. The cabbage should be softened, but not limp. 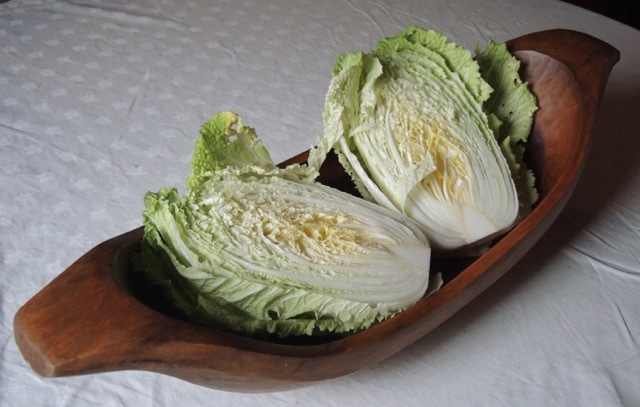 Take the cabbage out of the salt brine and rinse in a large bowl of water three times. Taste the cabbage. It should taste salty, but not overly so. Rinse again if necessary. Drain in a colander and press out excess water. While the cabbage is soaking, make “sea stock” and seasoning paste. You can also prepare other vegetables you might want to add in to the kimchi. This Simply Seoul Kitchen recipe was published in the Atlanta newspaper. I scaled it down for a single 2-pound head of Napa cabbage. I also reduced the chile flakes by half in my own batch of kimchi. Use a food processor or blender to puree the onion, garlic, and ginger. Whisk the rice flour (I used toasted rice flour) into the water. Add the onion mixture and whisk to combine. Stir in the chile flakes. I adapted this version from Holly, substituting dashi for her seafood stock made with anchovies and shrimp, and fish sauce for Korean anchovy sauce and salted shrimp. I wanted to use what I had on hand…or maybe I’m squeamish. Sea Stock: Dissolve 1 tsp instant dashi in 1 cup water. Or simmer a small handful bonito flakes and one 5-inch piece kombu kelp in 1 1/2 cups water for 8 minutes. Let steep 8 minutes before straining. Holly simmers 5 to 6 anchovies and 3 or 4 shrimp in 2 cups water to make sea stock. 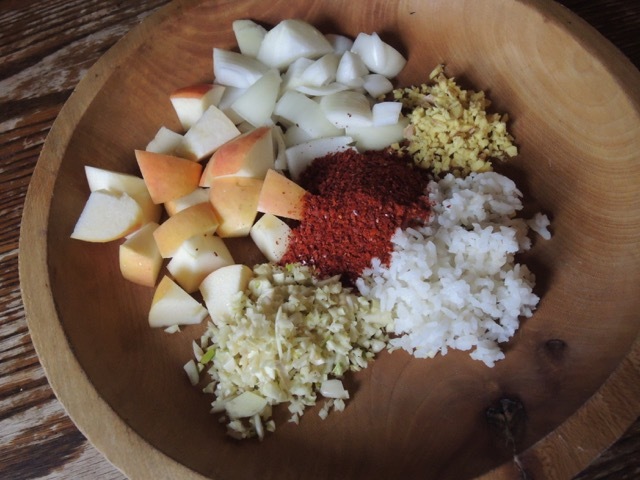 Put the onion, apple, ginger, garlic, rice, 1 cup sea stock(or water), and fish sauce in a blender. Blend to make a smooth puree. Pour into a bowl and stir in the chile flakes and sugar. Let sit 10 minutes. 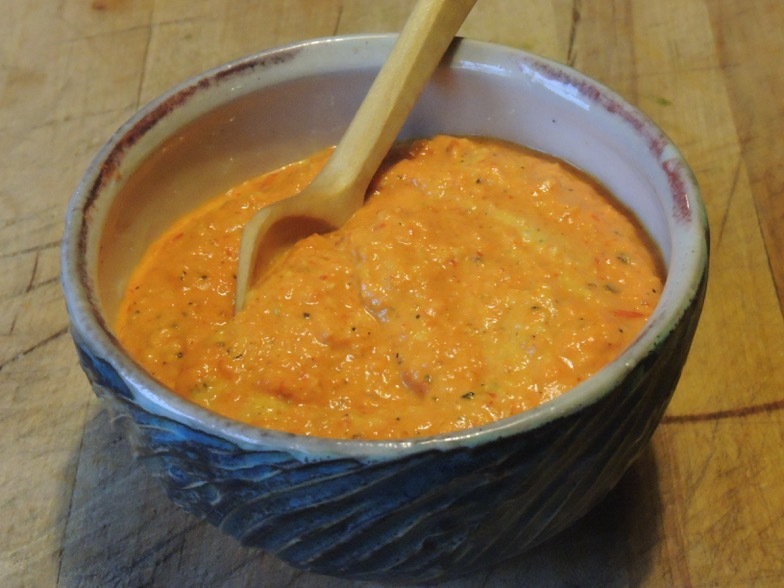 I made this paste with red-ripe, fresh serrano and jalapeno chiles Delicious! Use a blender to puree all the ingredients. Add more water if needed. Mix it Together: Chop the scallions into 1 1/2-inch pieces and mix them into the wilted cabbage. Pour 2/3 of the seasoning paste over the cabbage and mix it well. Use your hands, wearing plastic gloves to protect your skin from the chiles. Taste the kimchi and add more of the paste if needed. 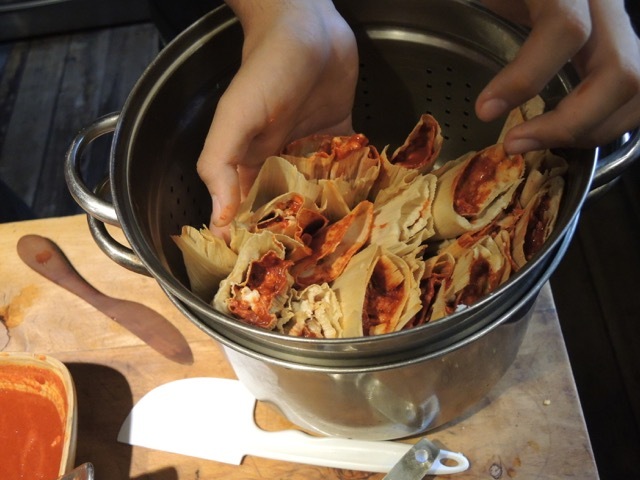 Any extra paste can be used to make small batches of kimchi experiments. Put the kimchi in a glass container that has a lid. Let it ferment at room temperature for 24 hours, or longer if you prefer a more fermented taste. Store in the refrigerator, where it will continue to ferment slowly. It is best eaten within a month. 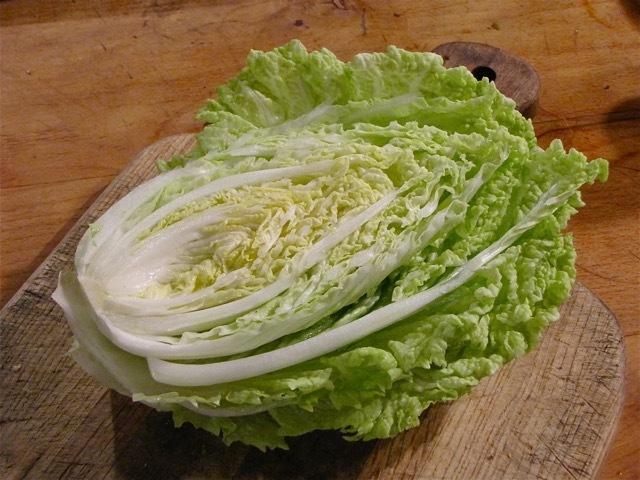 Adding chunks or slices of other vegetables into the cabbage kimchi provides more crunch and interest. 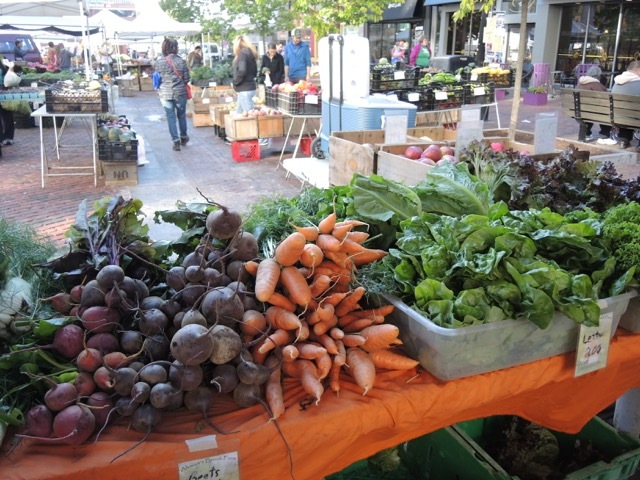 Carrot, onion, radish, daikon, kohlrabi, bok choi, sweet potato, beet, and turnip all make good add-ins. They also make great kimchi individually or in various combinations. 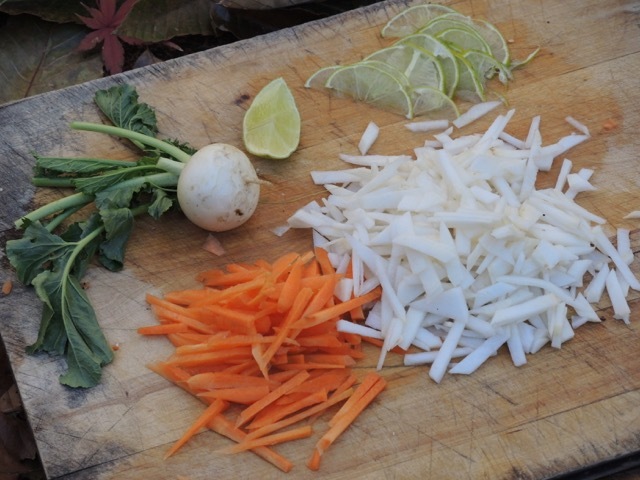 Method: Cut the vegetables into thin slices, chunks, or matchsticks. Cut bok choi in quarters. Sprinkle the cut vegetables with the salt. Toss and rub gently to coat all surfaces well. Let rest 1 hour, tossing gently 2 or 3 times. Rinse well and drain in a colander. Gently press out excess water. Toss vegetables with seasoning paste. 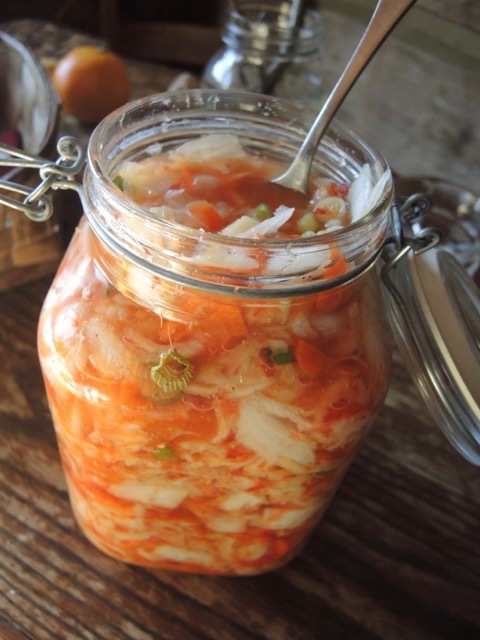 Eat the kimchi fresh, or let ferment a day or two before storing in the refrigerator. The Native Americans named each full moon for the characteristics of each month… Wolf Moon, Hunger Moon, Egg Moon, Thunder Moon….I declare January to be Eating Kale Moon. Winter is the season for kale. The leaves are sweeter, the green intensely nourishing… and kale is about the only thing left in the garden right now, so we’re going to eat it. We’ve been eating lots of kale since fall—wonderful kale salads, garlicky sautés, taco fillings, and stirred into soups. But I wanted to really honor this winter-hearty green. For inspiration, I turned to the Italians. I don’t think anyone does kale better, most likely because they enjoy powerful-tasting vegetables and aren’t shy about seasoning with garlic and chiles, not to mention delicious olive oil. I have three Italian cookbooks that reflect what Alice Waters calls “vegetable reverence.” They are Franny’s Simple, Seasonal, Italian from Franny’s restaurant in New York, Domenica Marchetti’s The Glorious Vegetables of Italy, and Cooking with the Italian Grandmothers by Jessica Theroux. All reveal Italian cooking as a celebration of vegetables …creating out-of-the-ordinary dishes with ordinary, simple ingredients and allowing vegetables to star in the menu. Simplicity and honesty in the cooking and devotion to seasonal eating are both part of the respect these cookbooks show to vegetables. This is an adaptation of a recipe from Franny’s. 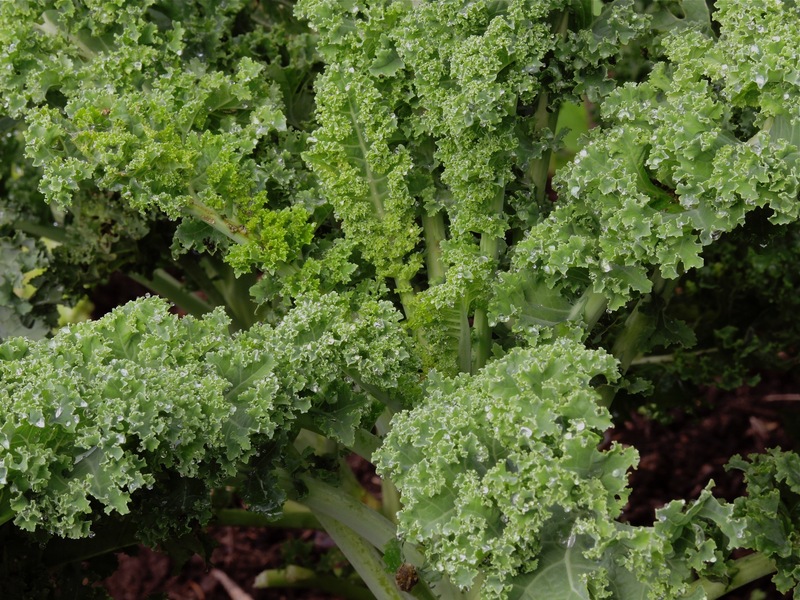 It doesn’t have to be made with Lacinato (Tuscan or Dinosaur are other names) kale, but this heirloom variety is sweeter and more tender than most and a beautiful dark black-green. Kale pesto is great for tossing with pasta—choose a wiggly shape like fusilli to hold the sauce. 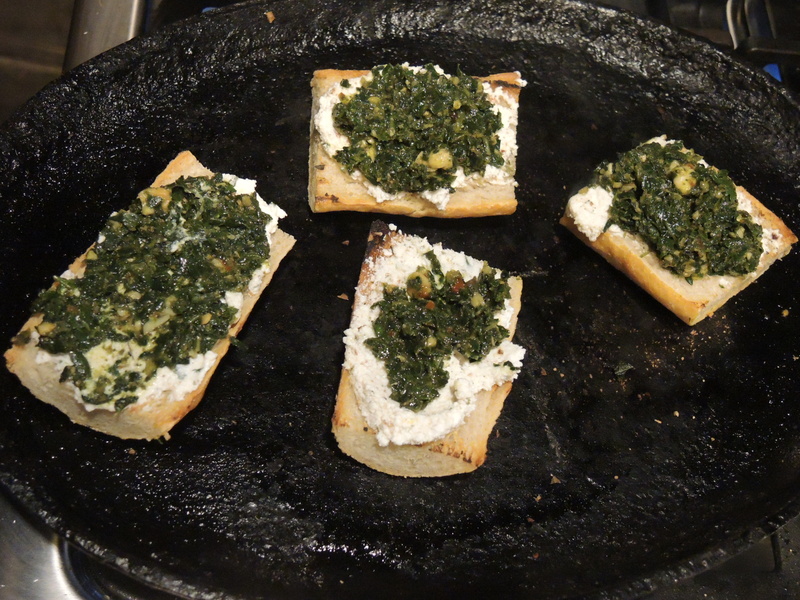 It’s also a wonderful with a smear of goat cheese as a topping for bruschetta. Toast the walnuts in the oven at 350 degrees for about 7 minutes. Set aside. Bring a large pot of salted water to a boil. Strip the kale leaves off the thick center ribs and add them to the boiling water. Cook 2 to 3 minutes, until tender. Scoop the leaves into a colander and cool with cold tap water. 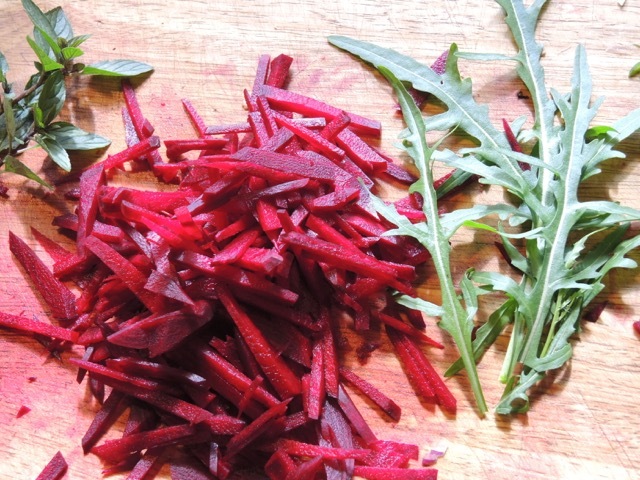 Drain and squeeze the leaves gently to remove excess water. Warm 1/4 cup olive oil in a small skillet with the garlic and red chile over low heat. Cook about 2 minutes, until small bubbles rise around the cloves and they soften. Add 2 Tbs water to the pan and remove from the heat. Transfer the kale, garlic-oil, walnut oil, parsley, lemon zest, salt, 1/2 of the walnuts, and the cheese (if using) to the bowl of a food processor. Pulse to make a coarse paste. Crush the remaining walnuts using a mortar and pestle and stir them into the pesto. Domenica Marchetti makes this risotto with butternut squash and Tuscan kale. 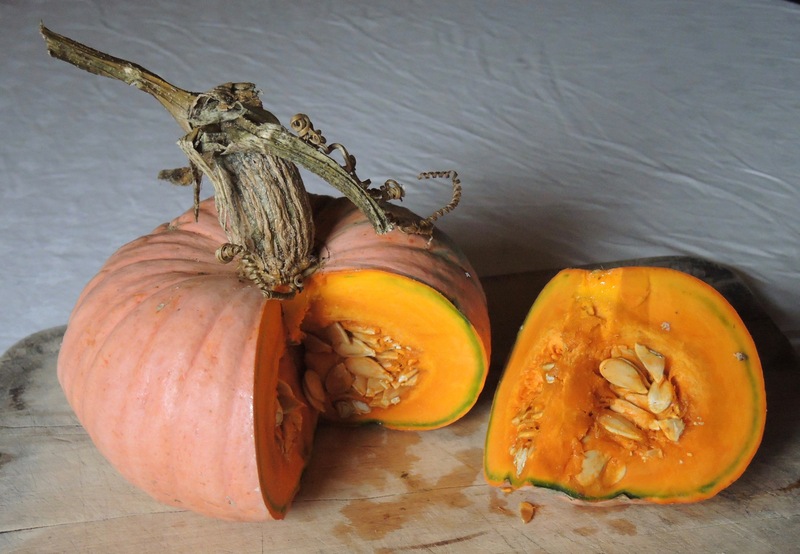 I used my wonderful Zucca Berrettina Piacentina (just saying the name makes my mouth water), a more flavorful squash from Seeds From Italy. They also supplied seed for Galega de Folhas Lisas, a curly kale. I like to think the flavor is incomparable, but maybe I just grow them for the way their names roll off my tongue. Warm the olive oil and onion in a Dutch oven over medium-low heat. Stir frequently for 7 or 8 minutes, until the onion is softened and translucent. Cut the winter squash into 1/2-inch cubes. 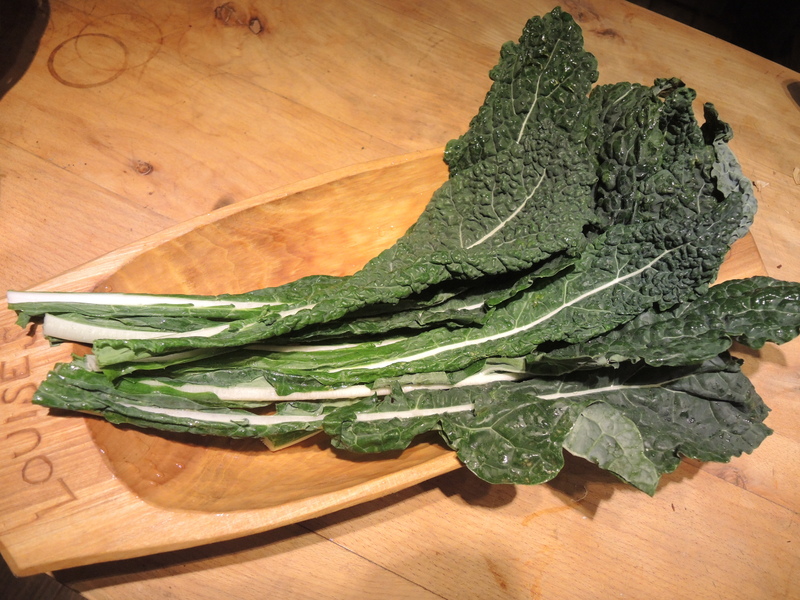 Remove the center ribs from the kale and slice the leaves into thin ribbons. Add the squash and kale to the onion and stir to coat them with oil. Sprinkle with salt and cook for 15 to 20 minutes, until the kale and squash are just tender. Add the rice and continue stirring 2 to 3 minutes to completely coat the grains with oil. Raise the heat to medium-high and pour in 1/2 cup wine. Stir constantly until it is absorbed, then add the remaining wine. When the wine is absorbed, begin adding the hot broth, 1/2 cup at a time. Reduce the heat to medium and stir frequently, allowing each addition of broth to be absorbed before adding more. Taste the rice after 20 minutes of cooking. It should be tender, but firm to the bite—al dente. Add liquid in smaller amounts as the rice approaches being fully cooked. It should be moist but not runny. Stir in the cheese to fully incorporate it into the risotto. Remove from the heat and season with salt and freshly ground black pepper. 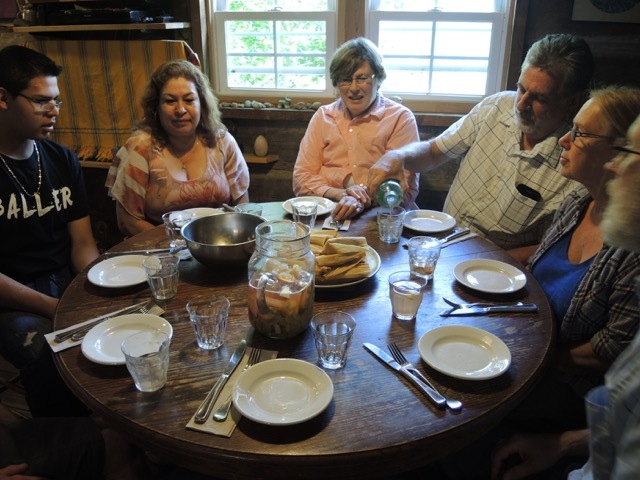 A soup from la cucina povera—poor people’s food. Drew calls it “frugal luxury.” Greens and beans are easy on the budget and combine to make a dish of luxurious flavor. In this case, a creamy and comforting background of beans is given a jolt of flavor and color from the deep bright green of kale and the warmth of chile. Zuppa is a soup made for dipping, so serve with crusty bread or croutons and a swirl of chile-herb oil. The soup also makes a fine sauce for pasta. If you start with dried chickpeas, the liquid from cooking the beans will provide a flavorful broth for the soup. I always make a big pot when I cook dried beans. The beans cook more evenly, and the extras freeze beautifully for future use. If you are using canned chickpeas, you can substitute a homemade or commercial vegetable or chicken broth for the bean broth. Chile-Herb Oil: 4 Tbs olive oil 2 minced garlic cloves, 1 tsp red chile flakes, 2 tsp finely chopped fresh rosemary, 1 tsp finely chopped fresh thyme… (Or 2 tsp Rachel’s Sicilian herb salt with sundried tomatoes, smoked chiles, onion, garlic, and rosemary) Mash the garlic into a paste with a pinch of sea salt with a mortar and pestle. Add the chile and fresh herbs and crush with the pestle. Whisk in the olive oil and allow to sit 1 hour. To cook dried chickpeas, start a day ahead. Rinse the beans and pick through them for small rocks. Put the beans in a pot with 1/2 tsp baking soda and add at least 2 qts water to cover. Soak them 12 to 14 hours. Drain the soaked beans, rinse well, and put them in a large pot with 8 cups fresh water. Bring to a boil and skim off any bean froth that rises to the surface. Reduce the heat to maintain a simmer and add the bay leaves, rosemary, dried chile, and whole garlic cloves. Simmer about 1 hour, or until the chickpeas are tender but not beginning to fall apart. Stir in 1 1/2 tsp sea salt and turn off the heat. 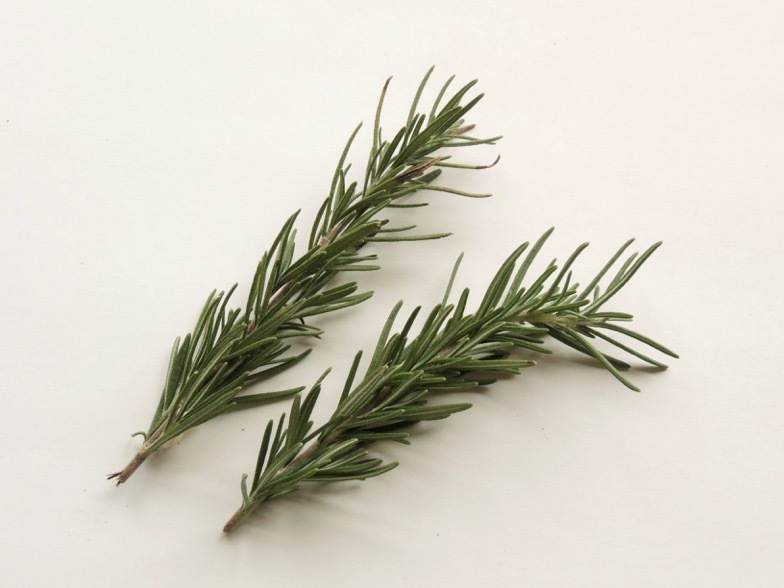 Remove the rosemary, bay leaves and whole garlic from the pot. Discard the herbs and squeeze the garlic cloves into the pot. While the beans are cooking, strip the kale leaves off the stems and cut them into thin strips. Wash and drain. Warm the olive oil in a saucepan or Dutch oven. Stir in the onion and cook 8 to 10 minutes, until soft and translucent. Add the minced garlic and chile flakes and cook 1 minute. Add 3 cups bean broth or other liquid and bring to a simmer. Add the chopped tomatoes and kale leaves; stir to combine. Cover and simmer 10 to 15 minutes, until the kale is tender. Set 1/2 cup cooked chickpeas aside. Add 1 1/2 cups cooked chickpeas ( if you are using canned chickpeas, add beans and their liquid) to the kale broth and simmer an additional 5 to 10 minutes. Use an immersion blender, food mill, or regular blender (be careful with hot liquid!) to puree the soup in batches. Add more beans if it is too thin, more broth or water if it is too thick. Season with salt, pepper, or red chile to your taste. Re-warm the soup if needed. Stir the reserved chickpeas back into the soup, or scatter them on top. I like to toast the whole chickpeas in a skillet with a little herb-chile oil before scattering them over the top of the soup. If you are making croutons, you can toast them in the oven. 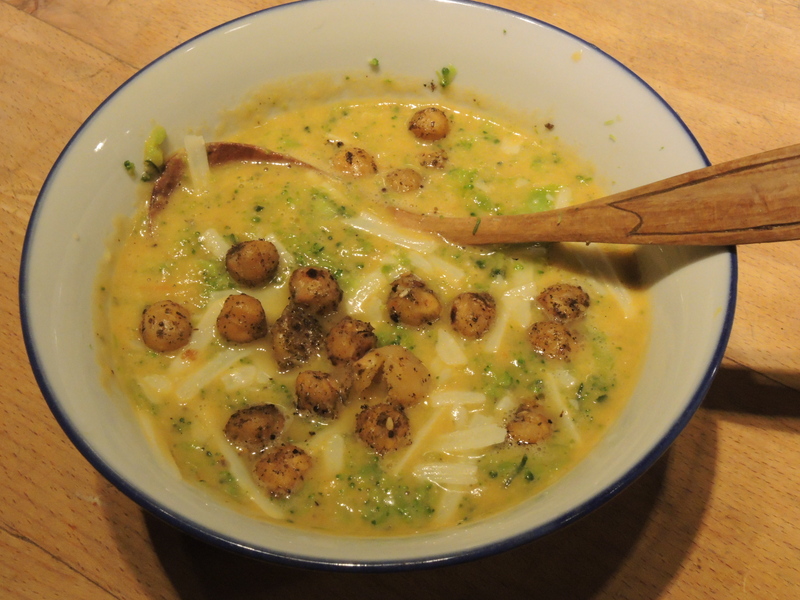 Serve the soup with toasted bread or croutons and a bowl of freshly grated pecorino- Romano cheese. Drizzle with chile-herb oil, or perhaps a squeeze of fresh lemon. Who would have guessed? Fresh turmeric is a revelation! The boring yellow powder that mostly gives color to curry powder is actually a mouth-popping, I-can’t-stop-eating-this, delicious flavor when eaten fresh (the difference between powdered ginger and fresh ginger root, only more so…). And it can grow in North Carolina!! I was very excited when a friend from Brasstown, NC, visited and brought a jar of her homemade turmeric pesto made with fresh turmeric grown in Clay County on Qualla Berry Farm. Turmeric (Zingiberaeae Curcuma longa) is a member of the ginger family and is known as “Indian saffron” because of its brilliant orange color. 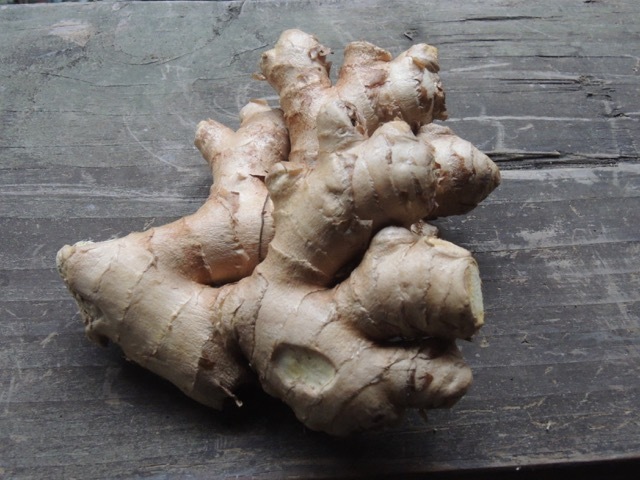 John Clarke and Karen Hurtubise grow both ginger and turmeric in a large hoophouse, harvest in October and November, and sell the fresh rhizomes at farmers’ markets as well as from their own farm. 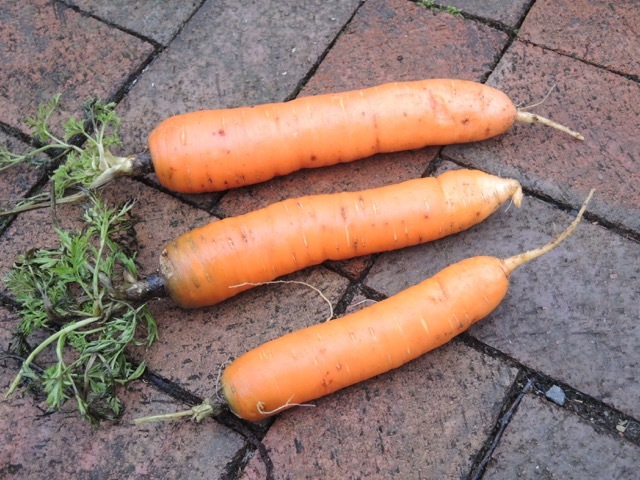 They advise that the rhizomes may be stored in a warm, dry, dark place for up to three weeks or sealed in zip-lock bags to store in the freezer for a year-long supply. Contact www.quallaberryfarm.com for more information. The fresh turmeric pesto is amazing. Can something have a yellow flavor? The flavor is sharp and earthy and somehow lets you know that it is sending good energy to all the cells of your body. 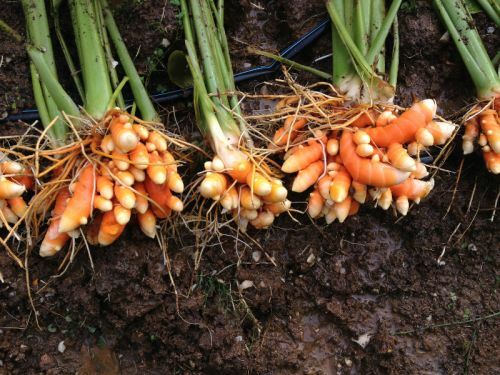 I have been using turmeric powder for its antioxidant, anti-inflammatory, and healing properties, but it is so much more fun to eat the vibrant fresh rhizomes. It’s like adding a burst of sunshine to your food. My Thai cookbook by Su Mei Yu says that fresh orange turmeric is used for its color, aroma, sweet crunchy texture, and peppery taste. When fresh turmeric isn’t available, Yu suggests substituting 1 Tbs grated carrot, 1/2 tsp grated fresh ginger, and 1/2 tsp turmeric powder for 1 Tbs minced fresh turmeric. This gives you an idea of the taste—a rather subtle, wild carrot flavor with hints of black pepper and the woods. I didn’t want to substitute; I ordered some from Qualla Berry Farm right away. When my order of fresh turmeric arrived , I cut some up into matchsticks and started eating. 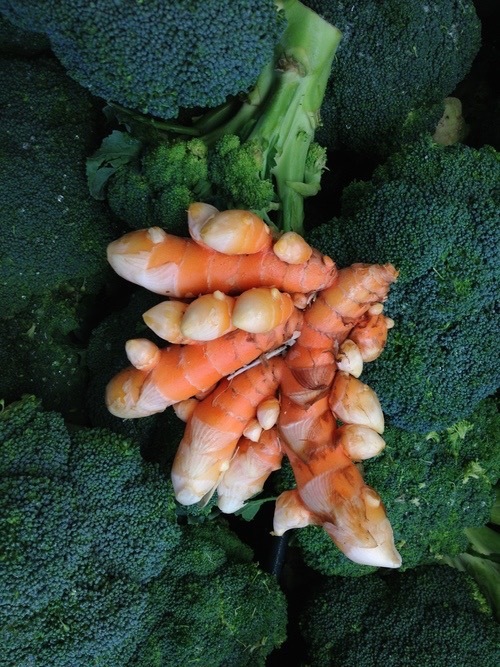 The fresh flavor is not just yellow, it is orange…like some crazy carrot. The rhizomes are easy to grate or slice and can be used raw to garnish or add to dishes for maximum color and texture impact… or pound into spice pastes or add with other aromatics like ginger, garlic, and fresh chiles to stir-fries or curry. Use minced fresh turmeric in soups, dips (try it in hummous, Romesco sauce, or mixed into yogurt or goat cheese), rice and other grain pilafs, vegetable or meat braises, lentils or beans, eggs…. or make tea. 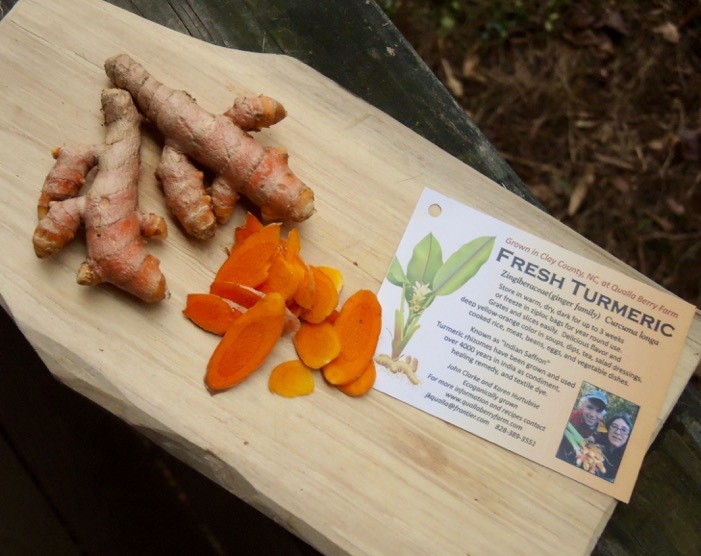 This recipe for fresh turmeric tea is from Qualla Berry Farm. The addition of black pepper enhances the medicinal properties of turmeric by making its healing components more easily absorbed. Chop or grate the fresh turmeric. Coarsely grind the peppercorns with a mortar and pestle or spice grinder. 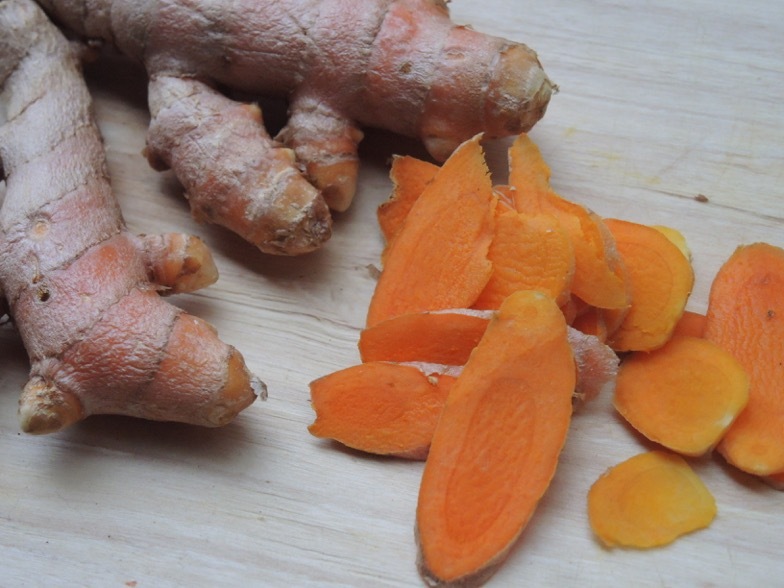 Bring the water to a boil and pour over the turmeric and pepper in a glass or ceramic pitcher. Allow to steep overnight or until cool. Strain into glass jars and store in the refrigerator. Strained out turmeric may be used in cooking. Add fresh lemon juice or honey to taste. Some people enjoy hot turmeric tea with milk. Carla Owen of Murphy, NC, provided this recipe for the growers at Qualla Berry Farm. This is a generous amount that should keep you in turmeric heaven for a while. Carla advises to eat some every day…in any dish. You can use it as a condiment, stir it into slow-cooked stews or braises near the end of cooking, or add a bit to the oil before a quick-cooked stir-fry or sauté. Put all ingredients in a food processor and pulse until you get the consistency you want. Add salt if you like and adjust quantities to your own taste. Store in glass jars topped with olive oil in the refrigerator. 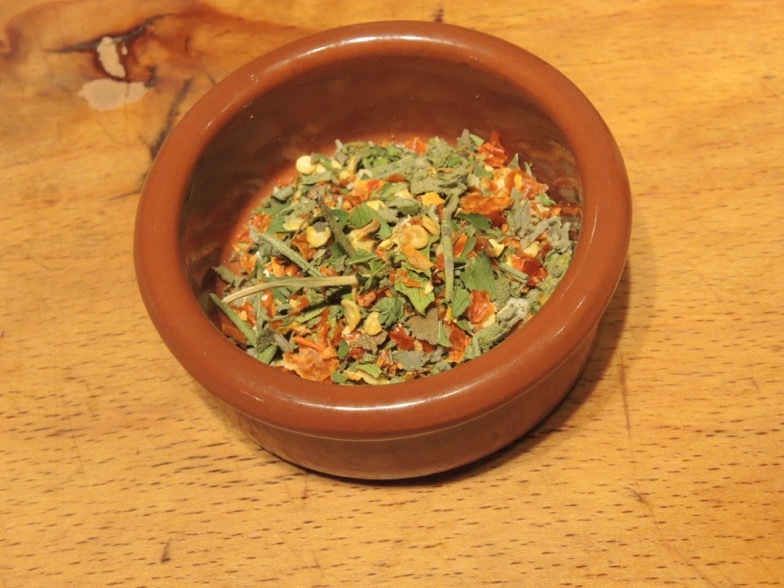 The pesto made by our friend Linda is a simplified version of Carla’s Spice Paste. It has a beautiful pale yellow color and subtle flavor. I loved it so much I ate it by the spoonful, spread it on toast and tortillas, and put it in everything until it was gone. Put all the ingredients in a food processor and pulse to make a rough or smooth puree, as you wish. Add lemon juice and salt to taste. I ran out of Linda’s pesto very quickly, so I had to make my own. I didn’t have any fresh turmeric rhizomes yet, but I did have a big jar of pickled fresh turmeric from India. It is pretty much just shreds of fresh turmeric in a salty brine, so I gave it a try. It was delicious, but on the salty side, so I mellowed it out with roasted red pepper. The color is even more joyful. 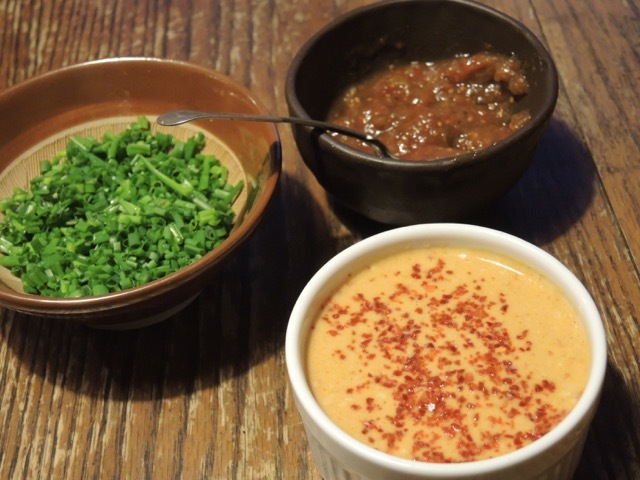 Put all the ingredients in a food processor and pulse to a rough or smooth puree. Enjoy! Chershi are piquant condiments from the culinary traditions of the Jewish community of Tripoli, Libya. I learned this from Jerusalem a Cookbook, by Yotam Ottalenghi and Sami Tamimi. They made mention of a crushed pumpkin salad—chershi kara’a, which sounded like it could only be more delicious with an addition of turmeric pesto. Roasted winter squash chershi is traditional; I used wedges of roasted sweet potato. Peel the sweet potato and cut it into 3/4-inch wedges or chunks. Toss with 1 1/2 Tbs oil and sprinkle with coarse salt. Spread on a baking sheet and roast in a 400 degree oven for about 25 to 30 minutes, or until crusty brown outside and tender inside. Turn halfway through. Heat the other 1 1/2 Tbs oil in a skillet and cook the onion over medium heat until golden brown, about 10 minutes. Scrape the onions into a bowl and stir in the harissa, turmeric pesto, cumin and caraway. Chop the roasted sweet potato into bite-size pieces and combine with the onion mixture. Add the parsley and lemon juice and toss to combine. Season with salt and freshly ground black pepper. Allow the flavors to meld 1/2 hour or more before serving. Combine all the ingredients for the meatballs in a large bowl. Mix gently with your hands. Shape the mixture into about 16 balls. Heat 1 1/2 Tbs oil in a large frying pan over medium heat until shimmering. Add half the meatballs to the pan and sear on all sides, about 4 minutes total. Remove to a plate and sear the second batch, adding oil if needed. Use the same pan to make the broth. Add the coconut milk and bring to a simmer. Whisk in the curry paste and cook 1 or 2 minutes. Add the shallots and cook 3 to 4 minutes. Add the broth and bring to a boil. Add the lime juice, sugar, fish sauce and reduce to a simmer. Return the meatballs to the pan, cover, and cook over low heat 15 minutes, or until cooked through. Stir in the carrots and sprinkle the top with fresh herbs before serving. The perfect condiment/salad to accompany meatballs, especially if you eat them with rice or wrapped in a tortilla. 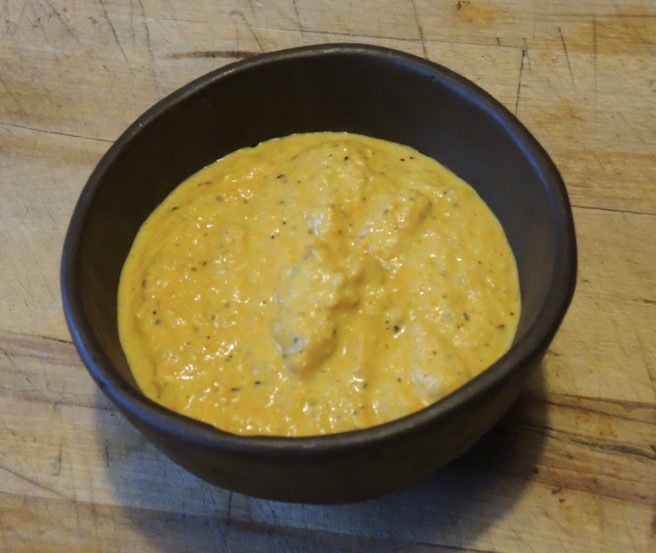 This is an adaptation of a Chris Schlesinger-John Willoughby recipe, “Sambal in the style of Java.” If you have a stash of turmeric pesto or spice paste, you can jump-start the dressing. Best eaten freshly made. In a large bowl, combine the cabbage, carrots, and bean sprouts. Use a whisk or blender to combine all the dressing ingredients. Adjust the seasonings to balance the flavors—hot, sweet, salty, and sour. Pour the dressing over the vegetables and mix well. Allow to sit 10 to 15 minutes. Sprinkle with minced turmeric and toasted nuts before serving. Sometimes a person comes into your life just like a shooting star—lighting up the sky and sending sparks into the universe. Rachel Williamson is a person like that. She stayed for a summer on our farm some years ago, and I instantly liked her so much that I gave her a couple of garden beds to tend. She had a lot of seedlings and not much space, so she planted intensively with wild companionship. I admit I had my doubts about the crowded plots, especially when the weather turned dry. Rachel hauled water and brewed 55-gallon tanks of herb tea to water her plants, and everything thrived! I am reminded of her garden each year when the volunteers from her sunflowers come up and brighten another growing season. Rachel has a farm of her own now, and she makes tea for people. She moved farther north up the Blue Ridge Mountain Range to an acre of land near Afton, Virginia, where she grows herbs and vegetables and turns them into the most wonderfully flavorful teas and culinary herb blends imaginable. You can choose from “Civili-Teas” or “Profani-Teas”depending on your sense of decorum (or lack thereof). Do you feel like “Content-Mint” or want to “Cheer the F***Up”? She also offers culinary blends with names like “Smoke”(smoked chiles, garlic and herbs—good for all things south of the border), Sicilian”( for the love of Sicily–dried tomato, smoked peppers, herbs…divine on pasta and in olive oil), “First Frost” (lemony, smoky flavor made with all the vegetables saved from the garden before the first frost, smoked and dried), and “Salt of the Earth” (lovage, parsley, onion, sweet and hot peppers, garlic, winter savory, thyme…A.K.A. “Good Salty S***”! Rachel markets her herbs mostly at fairs and farmers’ markets in her area, but offers them for sale on her website, fairweatherfarmers.com. I mostly avoided using dried herbs before I tried Rachel’s. Hers are the distillation of summer and are so tasty that I lick them off my hand. I pretty much sprinkle her herbs on everything–salads, soups, lentil and bean dishes, grilled or roasted vegetables, rice pilafs and various grains, roast chicken or meat, pop-corn…its an easy way to make almost anything taste more wonderful. 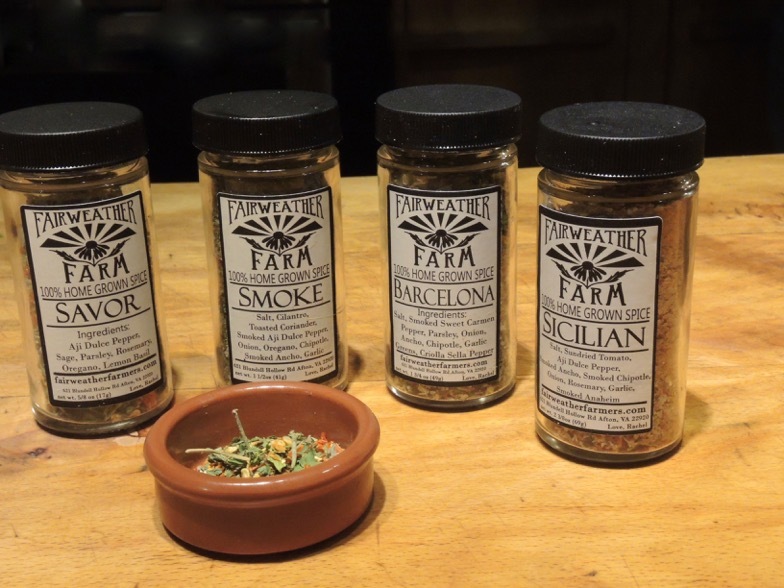 Here are some ideas, or excuses, from Rachel’s website for using herb blends. A note from Rachel: “I don’t actually follow recipes.” I would say she learned that from me, but it is just a trait we have in common. Use an immersion blender or a large mortar and pestle and whisk to make a smooth puree of the herbs, garlic, salt, and oil. Drizzle in the vinegar last. About garlic: The more garlic, the creamier the dressing. Use an entire head of garlic in the recipe to make a thick aioli sauce. Follow Rachel’s description and dream. Rub the herbs between your palms to release their scent as you sprinkle them into the oil. Stir well and allow to steep 1 or more hours before using. Alternatively, warm the herbs and oil gently in a pan over low heat for 1 to 3 minutes. Do not allow to simmer. Pour the oil into a jar or bowl and allow to steep 10 to 15 minutes before using. I ran out of Rachel’s herb blends and decided to try some batches of herb salt with the herbs still growing in my late fall garden. I still had rosemary, sage, thyme, chives, cutting celery, parsley, dill, and a few angelica leaves. Oh, and garlic. Put the herbs (no stems) in a food processor with 1/2 cup coarse salt. Pulse to chop the herbs and blend them with the salt. Add the fine salt and stir. Spread the herb-salt mixture on a baking sheet and dry in the oven at 200 degrees for about 2 hours. Sample blends: Rosemary-sage-garlic, rosemary-sage-thyme, thyme-celery leaf-chives-lemon zest-garlic-angelica…mix and match. Add freshly ground black pepper, red Chile flakes, or smoked jalapeno chiles if you like. I made this today using Rachel’s “Barcelona” herb blend. Never underestimate the value of a good potato. Ingredients: 2 Tbs butter, 1 Tbs olive oil, 2 bay leaves, 1 1/2 cups finely chopped onion, 1 diced carrot, 2 thinly sliced stalks celery, 2 thinly sliced garlic cloves, 2 cups chicken or vegetable stock, 4 cups water, 6 to 8 cups diced potatoes (about 1 pound), 2 tsp dried herb blend (I used a blend of smoked sweet pepper, parsley, parsley, onion, ancho chile, chipotle, garlic greens, and criolla sella pepper…the “Rivanna” mix of dill, lemon thyme, pepper and winter savory would by good, too), 1 cup milk or cream, salt, freshly ground black pepper, chopped fresh parsley. Warm the butter and oil in a Dutch oven over medium heat. Stir in bay leaves, onion, carrot, and celery. Cover and cook over very low heat for 10 minutes. Add the garlic and cook about 1 minute. Add the chicken broth, bring to a simmer, and cook 5 minutes. Add the water, potatoes ,herbs, and 1/2 tsp salt. Bring to a boil, then reduce the heat and simmer slowly until the potatoes are completely tender, about 25 minutes. Use an immersion blender, blender or potato masher to puree the soup with milk or cream. Taste, and season with salt and black pepper to taste. Garnish with finely chopped parsley. “Maine…the Way Life Should be,” reads the sign as you drive into the state, and so it was in late September when we traveled there. I couldn’t help myself. I bought gorgeous red and yellow sweet peppers, shiny eggplants, voluptuous red and yellow onions, and fresh-from-the-ground potatoes. And lots of garlic. From more than a dozen varieties, I chose “Georgian Crystal” (rich slightly smoky flavor), “Music”(“very big, hot”), “Rosewood”(soft colors on large, fat cloves), “Bogatyr”(marbled purple stripe…on the hot side), and Hampshire Porcelain”(good strong flavor, long storing). If you want to order some garlic, email her at vegetablesdance@gmail.com. Our friend Kenneth was our guide at the fair, and while I was ogling vegetables he attended a presentation on super-efficient woodstoves. When we reunited, I had bags of produce, and he had a newly purchased copy of “Cooking With Fire” by Paula Marcoux. Such serendipity! We headed back to the Pemaquid peninsula– a rocky spine of land sliding into the Atlantic Ocean, where Kenneth lives with his wife Angela and their son Conrad. They live in a clearing in the woods just big enough for their small hand-made house, a tiny garden, and an awesome fire pit made from an old cast iron cauldron. For our first night of cooking with fire, Angela fried potatoes in a pan over the hot coals, we roasted hotdogs and sausages using green sticks whittled sharp by Conrad, and toasted buns on the grate. Then we slathered on kimchi, sauerkraut, and balsamic-onion jam from the Common Ground Fair. The feast was well seasoned with wood smoke and friendship. Inspired by a recipe for Balsamic-Cipollini Jam by True North Farms in Maine, this marmalade has a sweet-tart flavor and is great with anything cooked on a grill, in sandwiches or omelettes, or with cheese and crackers. Or, just eat it by the spoonful. Cut the onions in quarters and slice them as thinly as possible. Warm the oil in a 10-inch skillet or sauté pan over medium heat and stir in the chopped herbs and chile (optional). Add the onions and sprinkle lightly with sea salt and black pepper. Toss well and reduce the heat to low. Cook, stirring occasionally, 15 to 20 minutes. When the onions are quite soft and beginning to color, add the sugar. Continue to cook another 15 to 20 minutes, stirring often, until the onions are golden brown and caramelized. 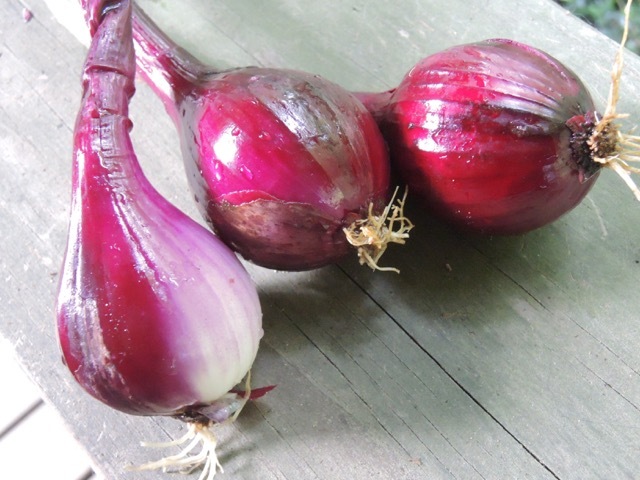 Stir in the vinegar and cook until the liquid is absorbed and the onions are soft and jammy. Ember-Roasted Onions — with thanks to Richard Miscovich and his tips for cooking with fire. You can make this delicious jam with ember-roasted onions, if you are so lucky to have them. They are easily made in a woodstove. Let your fire burn down to coals covered with gray ash, then arrange the coals in an even layer. Place unpeeled, whole medium-size onions on top of the coals. Turn the onions over several times as they roast, and adjust their positions in the coals so that they cook to the center without incinerating the outside. They are done when easily pierced with a kebab skewer. Make the jam: Allow the onions to cool in their skins. Peel off the skins, saving all the juice and any bits of charred skin that may be stuck. Chop the roasted onion and put them and their juices into a saucepan with the other ingredients for the jam. Cook over medium-low heat, stirring frequently, until the mixture is the consistency of marmalade. 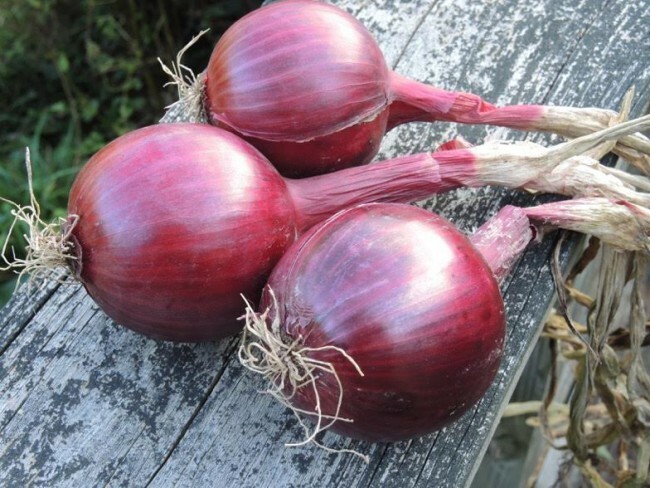 Ember-roasted onions are a great addition to salsas, Harissa, or Romesco sauce. The next night we decided to get more adventurous and try a recipe from Paula Marcoux—Pine Needle Mussels. 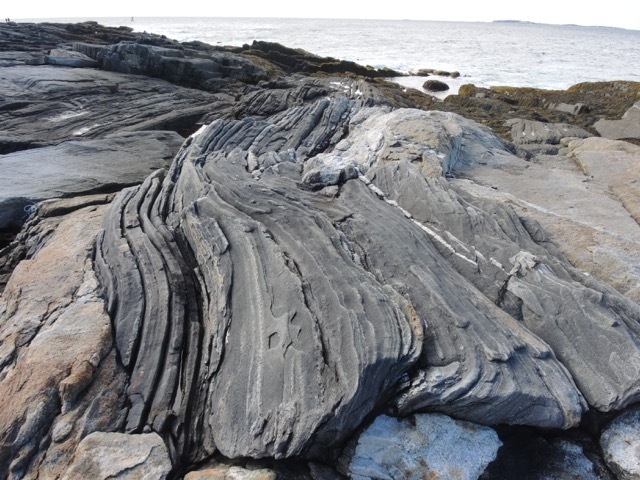 This required an excursion to Pemaquid Point at low tide, where the ancient rocks cradle tide pools that are home to colonies of mussels hiding in the seaweed. 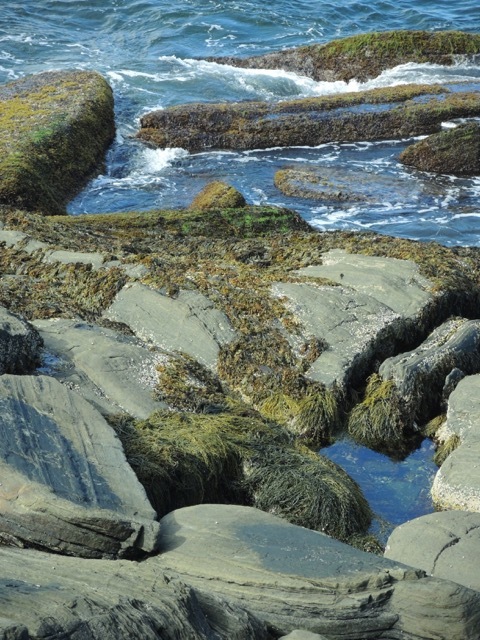 We scrambled down the ledges and fissures—the legacy of a long-ago time when the North American and European continents were torn apart and the rocks were up-ended in their struggle to stay with Maine. We eased our way along the slippery edges and reached into the cold water to pry the mussels from the rocks. They hold on tightly against the pounding of the Atlantic waves, but we managed to fill a bucket and headed for home. The next ingredient (actually, the only other ingredient) is a bushel of dry pine needles. Drew and Kenneth headed into the woods to procure them while Angela and I lit a fire and tossed the Common Ground Fair vegetables in olive oil to make a roasted ratatouille over the coals. The instructions for Pine Needle Mussels are to prepare a fire pit or cooking surface—a 3×3-foot board or large flat rock for the cooking surface (we used the cauldron). Place a potato with a slice cut off the end so that it stands up in the center of the cooking surface. Arrange the scrubbed mussels, pointy end up, so that they lean against the potato in concentric circles—a mussel mandala. Cover the assembled mussels evenly with pine needles, as deeply as possible. Put a glowing coal or lit match in the center of the pile, on top of the potato, to light the fire. Stand back and let the fire burn; when it dies down, the mussels are ready! That’s the theory, anyway. Our pine needles were wet from recent torrential rains, and refused to burn. After much smoldering, we piled dry twigs on top of the needles and succeeded in making a hot fire. Voila! The pine-scented, smoky mussels were the most delicious seafood we had ever tasted…even with bits of charred pine needle and assorted sea grit clinging to the shells. After we had devoured the mussels, we ate ratatouille and bruschetta with spinach pesto. I think Conrad had a few more hot dogs. Using a food processor, pulse the ingredients in stages to make a puree. Process the garlic and herbs, then zest and walnuts, then oils, and finally the Parmesan to make a rough paste. Subscribe to this feed by clicking below.